On Friday, the Appeals Chamber of the International Criminal Tribunal for the former Yugoslavia Appeals Chamber reversed the ICTY Trial Chamber’s conviction of two Croatian generals, Ante Gotovina (far left) and Mladen Markač (near left). 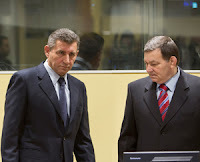 Gotovina and Markač had been convicted by a unanimous Trial Chamber in April 2011 of war crimes and crimes against humanity. A deeply divided (3-2) Appeals Chamber reversed the conviction and acquitted the generals. While the Appeals Chamber’s decision was celebrated in Croatia, some scholars in the international legal community highlighted its dubious legal reasoning and its apparent lack of consideration for established legal precedent regarding appellate review. In this post, I will briefly highlight four of the most problematic aspects of the Appeals Chamber’s decision. Each point supports my contention that the decision not only undermines the overall legacy of the ICTY as a neutral and just international forum, but also provides support for the Serbian view that Hague justice is political rather than legal. ► First, let me start with the dissenting opinions. To claim that Judges Carmel Agius (Malta) and Fausto Pocar (Italy) virulently disagreed with the majority would be an understatement. Judge Agius (right) said he thought that the majority was misinterpreting, ignoring and dismissing the findings of the Trial Chamber, while Judge Pocar (left) argued that the majority’s reasoning was “grotesque,” was driven by non-legal motives, and contradicted “any sense of justice.” I am not aware of any other appellate cases where the dissenting judges so scathingly reviewed the opinion of their colleagues in the majority. It is also noteworthy that the Trial Chamber in Gotovina and Markač had unanimously convicted the generals, whereas the Appeals Chamber seemed so deeply divided in its reasoning that one could almost imagine the ICTY appellate judges having passionate personal disagreements over these cases. ► Second, let me highlight the irregularity of the standard of review adopted by the Appeals Chamber. The Appeals Chamber correctly announced the standard of review which it was supposed to adopt: the appellate process is not a de novo trial, but instead, a process in which the reviewing judges look at the totality of the evidence, give deference to the Trial Chamber’s fact-finding, and disturb the evidentiary record only if no reasonable fact-finder could have made the relevant findings based on the existing record. It is unfortunate that in this instance the Appeals Chamber decided not to follow its own rule. The Appeals Chamber focused on the Trial Chamber’s conclusion regarding the proper standard for the accepted margin of error in shelling operations performed by the Croatian army in the so-called Krajina region. The Trial Chamber, perhaps erroneously, had determined that it would accept a 200-meter margin of error regarding shelling operations – that any shell that fell within a 200-meter radius of its purported target would be accepted as having hit its mark, but that any shell falling outside of such radius would constitute evidence of unlawful targeting. The Appeals Chamber determined that the Trial Chamber's 200-meter standard was wrong; however, the Appeals Chamber did not then proceed to announce the correct standard. In fact, readers of this appellate opinion were left to wonder as to how the Appeals Chamber viewed this error – as an error of law or error of fact? An error of law should have been corrected by a pronouncement of the correct legal standard in assessing the lawfulness of shelling operations; an error of fact should have been corrected only if, in light of the totality of the evidence, no reasonable trier of fact could have reached the same determination. The Appeals Chamber did neither. Instead, it founded its entire subsequent analysis on the allegedly flawed 200-meter standard, and it invalidated the rest of the Trial Chamber’s findings because of this apparently legally incorrect standard. The Appeals Chamber thus engaged in a de novo review of the facts, which it justified on the Trial Chamber’s adoption of the wrong legal standard. ► Third, the Appeals Chamber, instead of examining the totality of the evidence, proceeded to review every single piece of evidence in complete isolation. The Appeals Chamber focused on the allegedly incorrect 200-meter standard, to claim that it needed to review all the evidence de novo, piece-by-piece, and to determine that the record did not support a finding of unlawful or discriminatory attacks. For example, the Appeals Chamber found that Gotovina’s order to shell the town of Knin, which simply stated that the town should be shelled, was not evidence that the general ordered the shelling of civilian targets (because the order did not specifically state that civilians should be shelled). Instead, the Appeals Chamber determined that this order could be interpreted as directing that military targets should be shelled. Furthermore, the Appeals Chamber concluded that Gotovina’s statement – at the infamous Brioni meetings with the Croatian president and other leaders – that if needed, his troops could destroy Knin, was not sufficient evidence of Gotovina’s intent to shell civilian targets in order to drive out the Serbian population. The Appeals Chamber concluded that the Serbian population left willingly, not because of any forceful military action exercised by the Croatian army. 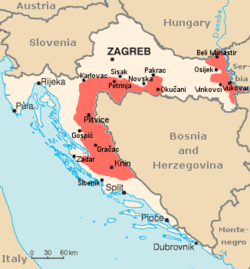 The Appeals Chamber disregarded evidence, set forth by the Trial Chamber, that Croatian leadership resettled the Serb-deserted Krajina region by ethnic Croats, and that after the Serbs fled, Croatia adopted discriminatory property laws which made it increasingly difficult for Serbs to own property in Croatia. Moreover, the Appeals Chamber discarded evidence that Croatian troops had engaged in numerous crimes against Serbs in the Krajina region, and that Franjo Tudjman (right), Croatia's President from 1990 until his death in 1999, repeatedly delivered politically and ethnically inflammatory speeches, driving an insurmountable wedge between the Croats and the Serbs. The Appeals Chamber examined evidence in isolation, disregarded inconvenient pieces of evidence, concluded that the record did not support a finding of unlawful shelling operations, and therefore concluded that Gotovina and Markač did not participate in a joint criminal enterprise to ethnically cleanse Krajina. When individual pieces of evidence are reviewed in isolation, they could arguably be interpreted similarly to the way that the Appeals Chamber did. However, when assembled together, like a jigsaw puzzle, a reasonable trier of fact could have concluded that these pieces of evidence pointed toward a joint criminal enterprise adopted by the Croatian political and military leaders to drive the Serbian population out of the Kraijina region. The Appeals Chamber was simply wrong in overturning the Trial Chamber. ► Finally, this appellate decision will further reinforce the Serbian belief that international justice is not blind and apolitical, and may dissuade Serbian political leaders from cooperating with authorities at The Hague. 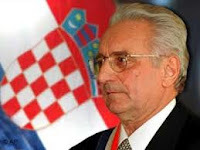 While most Serbs did not care about the individual pronouncement of culpability against Gotovina and Markač, they did and do care about the global pronouncement of responsibility against the Croatian leadership for crimes committed against ethnic Serbs in Krajina. One could argue that these crimes were less heinous than those committed by the Serbs against the Croats or the Muslims, but any issues related to the degree of culpability should have been handled by the ICTY judges at the sentencing phase. A person “less” culpable should not be acquitted; instead, such a person should be appropriately sentenced.